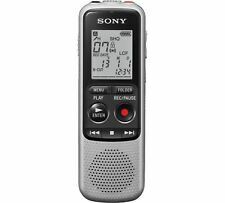 Sony ICD-BX140 4GB Digital Voice Recorder - Silver. Maximum Number of Files in one Folder - 99. 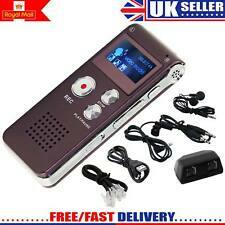 1 x Voice recorder. Working as drive free USB flash disk. Recording format:WAV /MP3. LCD screen with backlight. Display:LCD screen. 1 x Audio cable. Display hours and minute (24-hour format). Playing back via high quality speaker. 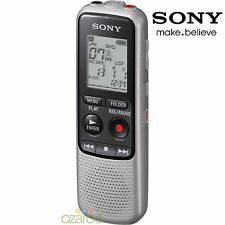 Sony ICD-BX140 Digital MP3 Voice Recorder 4 GB Dictaphone Dictation Dictator. 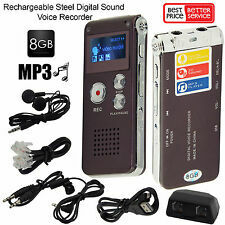 1 x 8GB Digital Voice Recorder. Recording indication. Recording and replaying of recording files. USB Drive / Disk. USB connecting, facilitating upload and download of voice files. You can choose to delete a single file or all files. GorillaSpoke, The SPY Gadget Experts. Free P&P to Worldwide! & 1 X 8GB USB SPY Pen Cam) Video camera and DVR housed in a real, working ballpoint pen. DVR records video at 30fps. Olympus RS-28 Foot Pedal E1-BZ8194-01 AU0608 *BNIB* Box a little tatty has been stored. The footswitch RS28 incorporates 3 buttons to easily control your transcription software. Just play, stop rewind etc. with your foot and navigate through your dictation files while you can keep on transcribing. Olympus´ professional footswitches are designed for heavy duty use and to be comfortable even for operations over several hours . Please note: There are no software drivers included with this item. It will only work on your PC if you have driver software installed and these do NOT come as part of Windows and have to be bought specifically. High quality recording is essential for clear playback and accurate speech recognition results. When enabled, recording will start automatically when you begin speaking. WithKeypad lock, recording modesMP3 & WAV (PCM/SHQ/HQ/SP/LP), up to50 hours battery life in LP mode &calendar search. The Olympus AS2400-E1 Digital Transcription Kit includes the RS-28H footswitch and the E-102 stereo headset and the latest v2.1.0 DSS Player transcription software. The AS2400 -E1 transcriptions kit can play back DSSPro, DSS, WAV, WMA, and MP3 audio files. Mp3 Player (MP3 and WMA). LP: Long recording mode (ACT format). SP: Standard recording mode (WAV format). HP: Highest quality recording mode (WAV format). 1 English User Manual. Record through the built in microphone or earpiece - included. Also can be used as a spying listening device. Works with any PC and MAC computer and Android devices. NOT COMPATIBLE with Iphone and Ipad. Probably the Best Mini Voice Recorder Ever Built! UNIQUE DESIGN & PASSWORD PROTECTED RECORDINGS: We invite you in the pictures gallery to see why aTTo is so different. Through the upgraded user interface, easily search for your recordings and music files to play and monitor the recording levels. 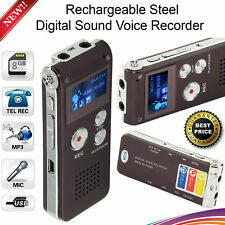 1 x Voice Recorder Instruction Manual 1 x Lithium Ion Battery. Noise cut - yes (clear voice). Olympus E-102 stereo headset. For PC use. The simple-to-use interface makes it easy to find old recordings, while the built-in USB connecter lets you plug into a PC. Auto Voice Rec reduces background noise so you can always hear what's being said. Plus, you can choose from six different formats depending on the quality of recording you want and the probable length of that recording. For easily searching and finding audio files, the recorder is equipped with a Calendar Search Function. Ever wish you could record audio of anything, anywhere?. Well you can! VOONEEN Keychain Voice Recorder provides convenience for your job and your daily life. The voices are always clear and easy to hear. Automatically record phone conversations into a voice database through the USB port of your computer. USB interface, plug and play, no driver needed. 1 x USB Cable. Record all incoming, outgoing, and missed phone calls. 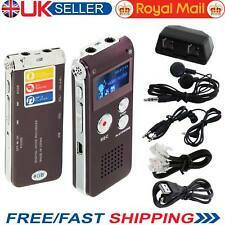 Sony ICD-TX650 dictaphone. Ultra slim and lightweight, instant recording, even when turned off, 360-angle sound recording, OLED bright display. Built-in micro USB connecter, PC application software (sound organiser), stereo headphones, carrying case/pouch, USB cable supplied. Connect via USB to Windows, Mac OS and Linux. Yes, I am in Co Armagh, Northern Ireland, United Kingdom. Can I collect the item?. Integrated motion sensor mutes microphone when not in use. Large speaker area for premium playback. Integrated pop filter for perfect quality. Ergonomically shaped for perfect fit in the hand. As new condition, boxed with driver etc. All what you see you will get 100%. The LS-P4 Audio Recorder from Olympus features three microphones and is designed to mimic the function of human ears. 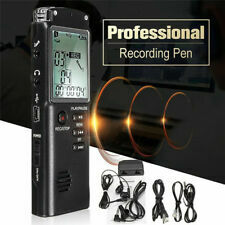 It is equipped with two directional microphones to create a stereo effect with a third omnidirectional microphone that is positioned between the other two on the recorder. 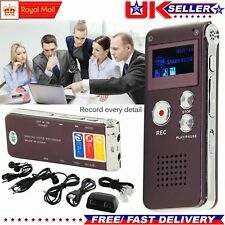 New listingVOICE RECORDER (DIGITAL). LOOKS LIKE A USB STICK. BRAND NEW AND SEALED. 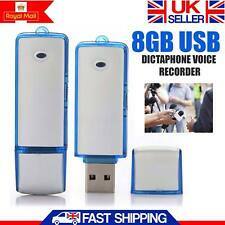 Thumbs up digital voice recorder which looks like a USB stick. PoweREC voice recorder will automatically start recording when sound is detected and you can record in a way to avoid long hours of silent recordings. POWER BANK & VOICE RECORDER - Best features combined into a SMART GADGET. 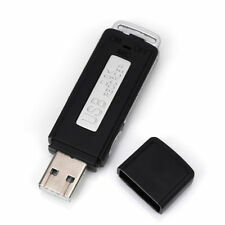 Smartex | Mini Voice Recorder 8GB / 150 hours USB Audio - Microphone Spy - Bug - Voice Recorder Flash Drive USB 2 in 1. This product is both a normal pen drive and a voice recorder, which was designed not to be identified, apparently is like a common pen drive. New as the box still has factory cellotape.